Thankfully, at last spring appears to have arrived, the days are longer and we have more time in daylight to enjoy outside with our dogs, wonderful ! 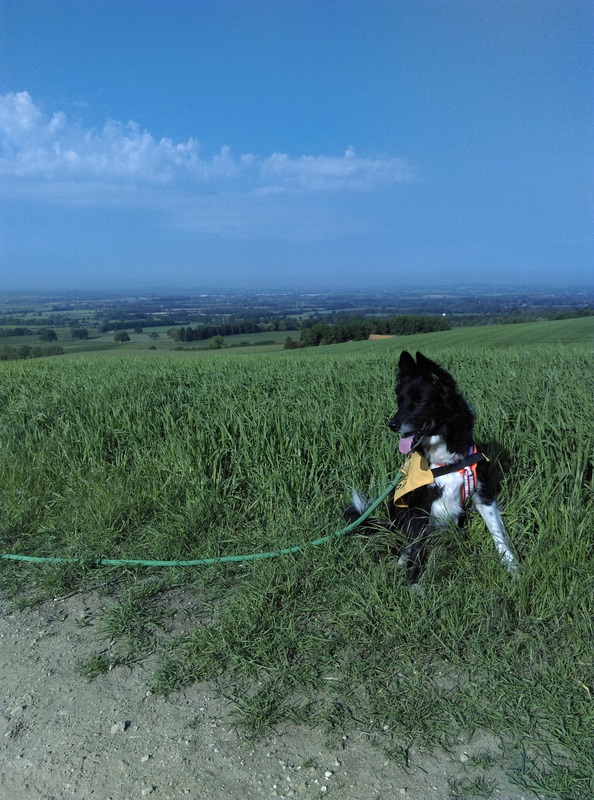 For most of us, there’s little to beat a long walk in the countryside with our dog, but we do have to take care of a few things to be responsible and considerate to others. Hopefully, none of these will be news to any dog owner, but I think it is well worth reminding ourselves from time to time. Keeping your dog on a lead around livestock and particularly sheep as many will be lambing in the spring should be common sense. Everyone thinks their dog would never chase a sheep . . . until they do. This could cause a ewe to abort, a terrified lamb unable to keep up with its mother to be separated, lost and die, let alone if a dog actually captures and bites a sheep or worse, a lamb. Imagine how terrible you would feel if your much loved dog did this, such a shock to see them behave like this (but completely natural), not the dog’s fault but rather ours, for not keeping them safely on a lead or long line. Less obvious is the risk to ground nesting birds. If your dog is allowed to run off footpaths and into fields and hedgerows, nesting birds can be disturbed and frightened off their nests leaving eggs to perish, nests and eggs can be damaged. You will probably be entirely unaware that this has happened. Our wild birds are very precious to our ecosystem, and many farmers put in significant effort to create habitats for them. That is pointless if we dog owners allow our dogs to charge about scaring them away ! There are of course risks to your dog, too. If they run through a crop which has recently been sprayed, they will at some point lick the spray from their coats and many sprays cause problems when they are ingested like this. Some farmers are really good about putting up notices to let you know when fields have been sprayed, but not all. If your dog strays from a footpath, they may find traps or bait boxes and be injured or poisoned, not at all a good outcome from a lovely walk. We need to remember that a farmer who sees a dog worrying their livestock (and that means causing them anxiety, not necessarily chasing or injuring them) is allowed, in law, to shoot that dog. What a terrible thing to happen on a country walk, and believe me, it does. In June, I am off to a professional conference about the problems of dogs around sheep and what can be done to reduce them – it’s that common and serious an issue ! We will be looking at educational initiatives for schools and for dog training clubs, what the media could do to help and hopefully, lots of other interesting ideas to get this important message out. It should go without saying to pick up your dog’s poo – sadly, I see so much poo left on footpaths around where I live and walk regularly. Worse still, picked up in a bag which is then left behind or even hung in a tree ! Madness ! Please carry a container for your full poo bags (we sell great ones at Gelert Behaviour Training), carry them with you until you get to a bin, and dispose of them safely ! Our dogs can, without our knowledge, carry parasites which can cause serious diseases in sheep and cattle, serious enough to affect a farmer’s livelihood as well as the more well known risks to children’s health from the more common types of internal parasites. (I will talk more about parasites in future) Just because you are in the countryside, you are not excused from picking up poo, I’m sorry to say ! I find it very sad when I see people “walking their dog” when the dog is running around doing its own thing and the people are chatting, or on their phone with earphones in, completely oblivious to what their dog is doing ! For me, a walk with my dogs is precious time to connect with them in their favourite places and share that walk, allowing them to sniff and explore, but interacting with them so we are truly walking together. There is always a value for my dogs in listening to me, I always have treats and toys with me, and we have fun practising recalls, stays, jumping (not so much now they are all old ! ), finding things I hide, finding bits of food etc. I am an Authorised Trainer for the wonderful Reactive Dog Group on Facebook – if you are a member, you will be familiar with the term MDIF – “my dog is friendly” ! Well, so are mine with their friends, but they are worried by dogs they don’t know charging up to them. I will shout out asking you to keep your dog away, or whatever I need to do to keep my dogs feeling safe. They are on their leads for all the reasons mentioned above. Even ‘though my dogs are ALL retired working sheepdogs and I absolutely know that all they would do is fetch the sheep to me, my local farmer wouldn’t immediately know that. I love my dogs far too much to take ANY risk with their lives, they are far too short already. I’m sure most people reading this are fully aware of all of these points – you may like to share them with others who perhaps are not so familiar with the countryside. Please do enjoy your walks, of course, I don’t want to put you off ! I would just ask that we all consider the other “users” of the countryside from wildlife, landowners, tenant farmers, other dog walkers and everyone else enjoying our lovely countryside at this fabulous time of year.